Home / Game Update / (UPDATE) MARIO KART 8 DELUXE PRODUCER SPEAKS ON BRINGING THE RACER TO SWITCH AND SOME ADDITIONAL IMPROVEMENTS TO EXPECT. 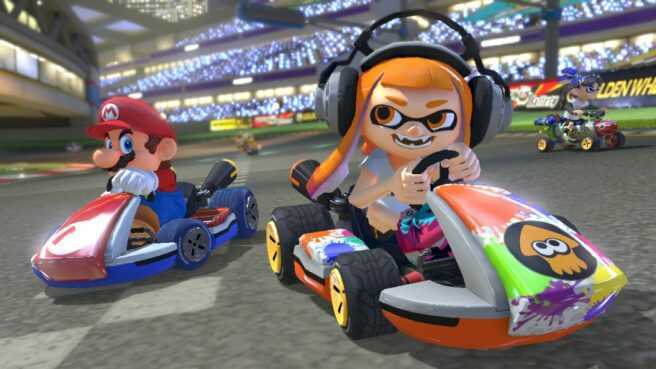 (UPDATE) MARIO KART 8 DELUXE PRODUCER SPEAKS ON BRINGING THE RACER TO SWITCH AND SOME ADDITIONAL IMPROVEMENTS TO EXPECT. Famitsu once again has quite a bit of Switch coverage in this week’s issue. Among the games covered is Mario Kart 8 Deluxe, including an interview with producer Kosuke Yabuki (director on the original, also the producer of Arms by the way). First, Yakubi commented on why Mario Kart 8 is being brought to Switch. He explains that the system can be played as a console, on the go, by sharing controllers, and can be experienced online. As a developer, Yabuki thought it would fit well with Mario Kart, and wanted to offer a Mario Kart to fans as soon as possible. So therefore they started developing Mario Kart 8 Deluxe using Mario Kart 8 as basis. Yabuki says development went very smooth. Nintendo was able to achieve a 1080p resolution at 60 frames per second while Mario Kart 8 is being displayed on the television. The team used the Wii U version as a base. As a result, the nature of Switch’s hardware could be better understood by comparing both systems. Gyro controls are now more precise, making for better controls overall. Yabuki believes players will be able to feel the improvements when trying it out for themselves. With Mario Kart 8 Deluxe, gyro controls and regular analog stick controls can work together. You can use gyro controls while riding along a big curve, then switch to analog controls while going down a straight path as an example. Regarding new characters, the team expressed interest in featuring Splatoon since having Zelda and Animal Crossing characters on Wii U was well-received by the fans. Because of this, Yabuki talked with Splatoon producer Hisashi Nogami and it ended up as collaboration. You can choose Link, Isabelle and Inkling from initial roster. However, Yabuki wouldn’t say if all characters can be used from the very start. Mario Kart 8 Deluxe now allows for two items to be carried at the same time. It’s similar to Mario Kart: Double Dash’s system, but the team had built it from scratch here. Thanks to more memory and CPU’s higher capability that Switch offers, now they can put in more items and all twelve racers can hold two items each. Mario Kart 8 Deluxe also brings in the new Feather item. This is an exclusive item for Battle Mode. It can be used to jump and dodge shells and jump walls. Also, if you attack an opponent’s balloon, you can steal it. So far, Balloon Battle and Bob-omb Blast have been officially announced. Yabuki officially confirms that there are three more battle modes. Each one can be played online. Finally, about DLC, all content originally made available for Mario Kart 8 is included in the Deluxe version. Yabuki was asked about potentially preparing DLC for this title, but only noted that he can’t say anything, and mentioned with a laugh that there is enough content to play for a long time if nothing else is released.